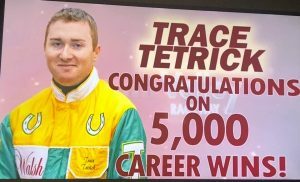 Trace Tetrick, the all-time leading driver at Harrah’s Hoosier Park and winner of seven titles at the track, scored his 5,000th career win Sunday, April 14 at Miami Valley Raceway. Tetrick earned the milestone with a victory behind Harry Carry in the afternoon’s fourth race on the day. Tetrick set up his 5,000th win on Sunday with a pair of wins Saturday night at Harrah’s Hoosier Park to head to Ohio with 4,999 wins. The victory with Harry Carry was his 161st of 2019 and he has already scored more than $1.4 million in purse earnings this year. The youngest of three boys in the Tetrick clan, Tetrick began driving in 2003 in his home state of Illinois before venturing into Indiana in 2005. Starting in 2007, he has earned a minimum of 250 wins each year leading up to his milestone. In all, Tetrick has driven in 31,208 races and scored in excess of $52 million in purse earnings. He is currently in fourth place in North America this season for wins. According to a press release from Miami Valley Raceway, Tetrick is the 116th driver to achieve the accomplishment in the history of harness racing. Tetrick also won the leading driver title at Miami Valley Raceway in 2017.